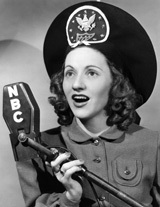 Her records (and radio programs of the year) feature top ballads, swing and novelty numbers that were popular at the time. 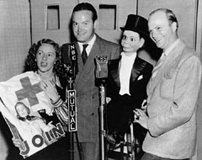 Connee appears on a radio program on the Mutual Radio Network’s “March of Dimes Appeal,” which is hosted by Eddie Cantor. Much of Connee’s humanitarian work remains largely undocumented, and her work with March of Dimes was one important part of it. 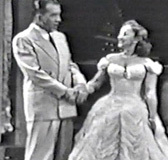 Connee is paired again with Bing Crosby to record “Tea for Two” and “Yes Indeed.” This would be their last commercial recording session together until the early 1950’s. Connee is heavily featured on Bing Crosby’s Kraft Music Hall programs. “Sister Constance,” as he calls her, will usually sing one or two solos and then duet with “Brother Bingstance,” as she refers to Crosby. 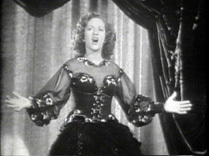 Connee appears in the Paramount Picture,” Kiss The Boys Goodbye,” and sings “Sand In My Shoes,” along with Rochester. 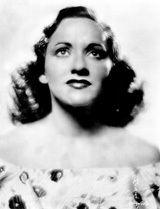 She would cut a solo recording of the song on June 28, which ended up being one of her most successful sides of the 1940’s. Connee cuts two takes of the song, “Poor Butterfly” with Victor Young and His Orchestra. The mournful ballad was set to be released later in the year but Connee said that it was rejected by Decca. The reason? Decca didn’t feel it was appropriate as America entered World War II against the Japanese. Connee had participated in radio programs with wartime focus even before Pearl Harbor thrust America into the war (“Greek War Relief,” January 1941, “China War Relief,” June 1941). Many of her radio programs in this period would focus specifically on our GI’s, sending a bit of home to them, whether they be on some island in the Pacific, some dock in New York or a battlefield in Africa. Many of these “Command Performance” programs featured dedications to companies, stations and individual servicemen throughout the Pacific and European Theaters of war. American Federation of Musician’s recording ban begins and all commercial recording with members of this musician’s union stops. Connee cuts no other sides until April, 1945. Connee is paired with Eddy Howard’s Orchestra to record “Stormy Weather” and “The GI Jive” for V-Disc. The V-Disc recordings were made for soldiers and musicians donated their time and talent with the agreement that these recordings would not be commercially released. Only “Stormy Weather” was issued for soldiers. Connee’s father, AC Boswell dies in New Orleans. AC had been ill for several years following a stroke. 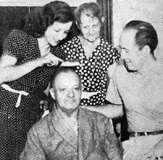 The photo shows Mr. Boswell surrounded by Martha, Mrs. Boswell and George Lloyd (Martha’s husband) taken in 1937 when Martha had come to New Orleans to help take care of her father after his first stroke. Connee guests for the first time on the “Chesterfield Supper Club,” hosted by Perry Como. She would guest on this program many times in the coming months. For the first time since the AFM Recording Ban began in 1942, Connee is back in Decca’s recording studios in NYC and cuts several sides with a group called the Satisfiers. 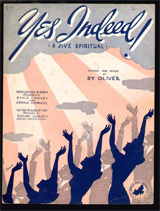 These recordings include “Who’ll Lend Me a Rainbow” and “When I Come Back Crying.” On April 30th, they return and record “You Can’t Say I Didn’t Try,” and “There Must Be A Way.” “Rainbow” and “There Must Be A Way” are released right away; however, the other two tracks aren’t released until years later. These tracks are later issued under Coral 60040, listed in Billboard’s March 26, 1949’s “Advance Record Releases” column. While the war in Europe has now ended, the Pacific front still rages on. Connee and her “V-Disc Play-Fellows” record two more sides for V-Disc records for soldiers: “Goodnight Sweetheart/Shine On Harvest Moon,” “Way Down Yonder in New Orleans,” and “Bell Bottom Trousers.” “Orleans” is a rare recording not just because it was a V-Disk, but because it also features Connee playing piano during the introductory passage. One other track, “If I Had My Way,” was recorded but remains unissued. Connee records four (released) sides for Apollo Records with the Jerry Jerome Orchestra. These very hard to find sides are significant in that she will not make any commercial recordings again until December of 1951. Why she decided to take such a long break from commercial recording at a time when popular vocalists were rising in popularity as the Big Bands died down remains a mystery. Connee’s mother, Meldania Foore Boswell, passes away in Peekskill, New York. 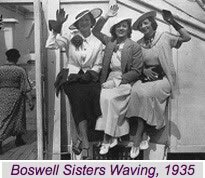 Mother Boswell had been a strong influence on Connee and had refused to accept that her daughter could not achieve as much as anyone else despite her childhood paralysis. She is buried in Peekskill. Connee appears on the “Show of Shows” program at Madison Square Gardens in NYC. The event is part of the effort to raise funds for New York University-Bellevue Medical Center on the East Side, and is attended by some 17,000 guests. 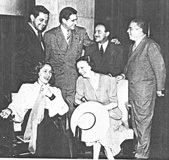 Milton Berle, Frank Sinatra and Helen Hayes are among the performers. Connee’s longtime producer and co-founder of Decca Records, Jack Kapp, dies from a cerebral hemorrhage.